The excitement of the NFL free agency period has come and gone, and while there are still deals to be had, the headline players have now all signed, and the excitement is continuing to build towards the 2018 NFL Draft. That doesn’t mean we can’t look ahead to next offseason though, with a whole host of players currently set to hit the market in 2020. Not all of these players will reach the open market, and most will be key candidates for the franchise tag should they not agree to new deals with their current teams, but it’s fun to see who could be the headline players next offseason. So with that in mind, here are the top 10 players who are currently slated to hit free agency. 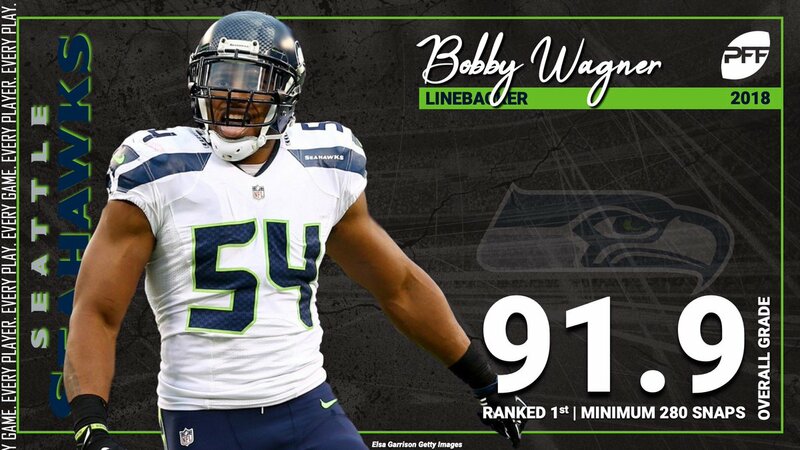 Arguably the best linebacker in football, Wagner is entering the final year of the four-year, $43 million contract extension that he signed with the Seahawks. The All-Pro finished the 2018 regular season as PFF’s highest-graded off-ball linebacker at 91.9 overall, and set the standard for efficient tackling throughout the year. Wagner missed just one tackle across his 892 defensive snaps and 139 tackle attempts in 2018. Even though he’s entering his eighth season, Wagner will likely reset the linebacker market in a big way on a future deal. The years and injuries are adding up, but Chris Harris Jr. remains one of the best and most versatile cornerbacks in the NFL. He’ll be wrapping up a $42.5 million contract extension with the Broncos this season, and with the addition of slot cover-corner Bryce Callahan, he’ll likely see more outside coverage next season. Despite being limited to 12 games last season due to injury, he still finished the regular season with the fifth-highest coverage grade (86.0) and allowed a passer rating of only 63.6 on throws into his coverage, ranking sixth. Harris will be a steal wherever he lands in the 2020 offseason. The Cowboys have some major decisions to make in the near future on young players that are reaching the end of their current contracts. Cooper qualifies as one of those players, as he’s finishing up the fifth-year option of his first NFL contract. After the trade from Oakland this past season, Cooper completely transformed the Dallas passing attack, as well as rejuvenated his own up-and-down career. 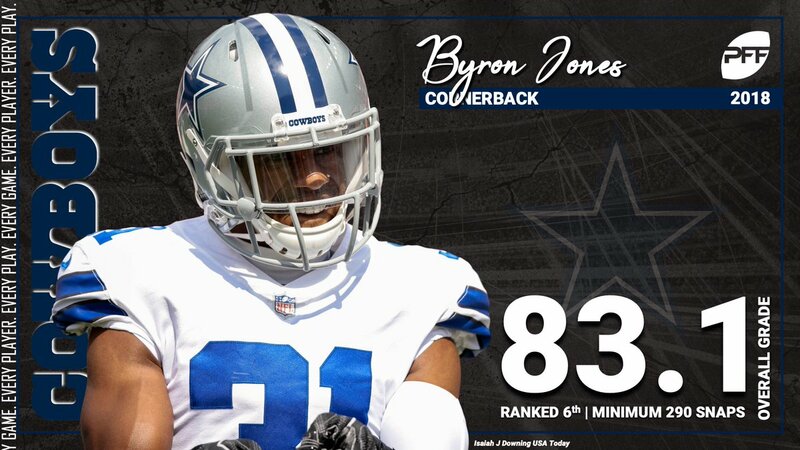 He earned an overall PFF grade of 82.1 after arriving in Dallas, the best mark of his career. Still currently only 24 years old, Cooper is set to cash in on the rising wide receiver market. After his best season yet, the Falcons made a move to place the franchise tag on Jarrett for the upcoming season, at $15.2 million. He took his career to the next level in 2018, bringing his overall grade from 83.6 to 91.0, tying him for the fifth-highest grade at his position. His pass-rush grade of 86.7 was good for the fifth-highest league-wide, and his 9.6 pass-rush productivity was seventh-best. On the season, he produced 36 hurries, 11 hits, and six sacks. 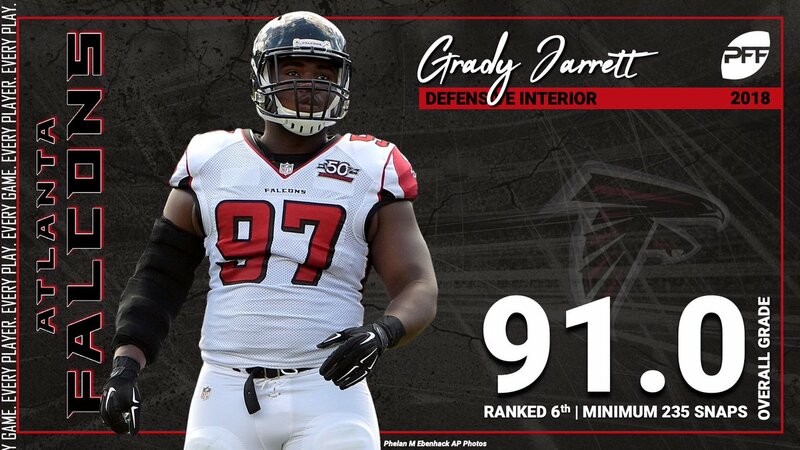 The Falcons are yet again making Jarrett prove himself with elite-level play before breaking the bank on a new contract for their disruptor along the interior defense. Potential landing spots will be plentiful if he reaches the open market in 2020. The Cowboys asked him to prove it in 2018 under the franchise tag, and Lawrence did just that. His 89.5 overall grade this season ranked seventh among all edge defenders in the NFL, and his 66 total pressures were good for 13th at the position. After failing to reach a contract agreement this offseason, the Cowboys placed the tag on their star edge rusher yet again for the upcoming season. By doing so, Lawrence will be another potentially lucrative contract that the Cowboys will have to navigate through during the 2020 offseason. If he’s able to hit the open market, Lawrence will finally be rewarded with a long-term, game-changing contract at the edge position. Bulaga is entering the final year of the five-year, $33.75 million contract he signed with the Packers back in 2015, and he will look to cash in on the bloated offensive line market following his ninth season. The long-time Green Bay right tackle battled injuries in 2018, but had an impressive season nonetheless during his 781 total snaps. The veteran ranked second in pass-blocking grade among right tackles at 84.1, and he’s gone 136 straight pass blocks without allowing a pressure, which is the longest active streak for all offensive linemen outside of centers. Jones is yet another impact player for the Cowboys to make the potential free agent list for 2020. He’ll be playing the 2019 season under his fifth-year option, before possibly hitting the open market in 2020 at the age of 27. Jones was a solid safety in the Cowboys’ secondary, but his transition to corner in 2018 has propelled him to one of the best secondary players in the NFL. Even though he ended the year without an interception, he generated 11 pass breakups, and his coverage grade of 80.4 ranked 13th among cornerbacks who logged 300 or more snaps this season. His shutdown ability as a corner and his overall versatility in the secondary will have teams bidding against each other in 2020 free agency if he makes it to the open market. Byard has quietly been a superstar at safety for the Titans throughout the past two seasons, with overall grades of 85.3 (2017) and 88.4 (2018). Last season, he was a run-stopping force in his third year as a pro, as he finished with the second-best run defense grade (89.0) among safeties. He also played well when covering the slot, where he allowed an average of 0.65 yards per cover snap which ranked 16th at the position. With another strong season, Byard is a likely franchise candidate if a new deal isn’t reached in Tennessee. The Seahawks smartly placed the franchise tag on Clark this offseason as they attempt to reach a future deal with their reliable edge rusher. Clark will only turn 26 later this year and has three straight seasons with 10-plus sacks. His three-year (2016-18) pass-rush grade (79.2) ranks tied for 18th among the 50 NFL edge defenders with at least 1,500 defensive snaps in that span. He also turned in a career year in multiple respects in 2018, logging career-best marks in terms of total pressures (67), pass-rush win percentage (17.5%) and pressure percentage (17.5%). If Clark continues his consistent trend as a productive edge defender in 2019, he’ll find ample suitors if a new deal isn’t reached with the Seahawks by the 2020 offseason. Leonard Williams will only be 26 next summer after he completes the final stretch of the fifth-year option of his rookie contract in New York. The interior defender’s production has quietly been lost amid the Jets’ roster rebuild, but Williams has provided overall grades of 75.0 or greater in each of his four seasons in the NFL. The USC-product has also generated an average of 52 total pressures and 34 defensive stops over that span. At this point, it’s anyone’s guess if the Jets envision Williams as a part of their impending plans on defense. If so, a franchise tag could be in Williams’ future as the team drums up a worthwhile contract for their stud defender along the defensive line.